Selling tickets on the door of your event is a great way to fill seats at the last minute, but it can make it more difficult to keep tabs on your sales. If you take cash in hand and don’t record these sales, or aren’t able to check these attendees in, you’re losing valuable sales and customer data that could be used to make your future events more successful. The good news is Eventbrite offers a complete box office solution, in the shape of the Eventbrite Organiser app (available for i0S and Android). The app enables you to easily record sales made outside of Eventbrite and captures customer information – and all you need is a mobile device. You can sell all ticket types on the door by simply selecting “Everywhere” as a sales channel in the ticket settings, but you can also create ticket types specifically to be sold on the day. Perhaps you want to create a discounted ticket for last-minute sales to encourage people to fill any empty seats or take the place of no-shows? To do this, create a new ticket type and then select “At the door only” in the dropdown. Once you have saved all your ticket types they will appear in the Organiser app. When you have a customer wanting to buy a ticket, just check on the “Sell” tab at the bottom of the screen to access them. Tap on the ticket type and use the plus or minus buttons to select the quantity before adding them to the cart. If you have enabled the collection of attendee information (done in the app’s “Account settings”), you will now be prompted to enter the customer’s details. The same questions you set up on your order form for advance sales will be asked as people are purchasing tickets at your event. This could be anything from basic information, such as name and email address, through to much more detailed questions, but be careful not to overdo it. While it’s good to collect data, you don’t want big queues forming as you ask endless questions and enter the responses into the app. Any information you collect is synced to your existing customer data so you can pull down reports inclusive of online and offline sales. If you are using a CRM system such as Salesforce or Infusionsoft, which you have integrated with Eventbrite via one of our APIs, attendee data will be automatically synced to it. Before finalising the purchase you are also able to apply promo codes. Utilising promo codes can really help you with a last minute sales push. Perhaps you wish to hand out flyers on the day of the event, encouraging people to come along that evening by offering money off their ticket? You can easily set up discount codes in your Eventbrite dashboard. You’re able to record payments in both cash and card, you just have to pre-configure the accepted payment methods in the app’s “Account Settings”. If you want the ability to accept card or contactless payments on the door you can buy or rent a card reader that works with your mobile device. PayPal offers a card reader for purchase at £75, taking a 2.75% cut of each transaction made. Select the payment type being used and tap “Paid” to complete the purchase. The order will process (internet connection required) and you’ll receive a success message once it’s complete. Attendees won’t receive a receipt automatically, but if they want one, you can email it from the “Order Confirmation” screen. One of the big benefits of the Eventbrite Organiser app is it can be used simultaneously across multiple devices. This means you can have more than one person selling tickets and checking attendees in. Simply grant subusers access from the “Account Settings” section of the administrator account. After you’ve completed a sale you can continue to process that attendee by checking them into your event. This can take place automatically by selecting “Auto check-in” in the app’s settings. For those who have pre-purchased tickets, check-in can also be carried out through the Eventbrite Organiser app. Whether they arrive with a printed or digital ticket, you can register their entry by using your device camera to scan the barcode or QR code on the ticket. This helps facilitate a quick and smooth entry process and gives attendees a better experience. You can also carry out check-in manually, which provides a simple solution if an attendee has forgotten their ticket. Go to the “Check In” tab at the bottom of the screen and find the order by searching by first or last name. Just swipe your finger to check the attendee into or out of the event. Another feature you can enable in your Eventbrite dashboard to maximise ticket sales is “Collect offline payments” (find it in the “Set payment options” section). This allows people to reserve tickets in advance and then pay on the door. If an attendee has a ticket that still needs to be paid for, the app will prompt you to collect payment when you check them in. Because you can use the Eventbrite Organiser app across multiple devices, you can have event staff selling and checking in attendees at different locations. Meanwhile, you can see the data updated in real-time, keeping tabs on how many on-the-door sales have been made and your total event sales figures. You can also track which guests have arrived (vs. your no-shows) and where and when they’re checking-in (this will give you a sense of what the busiest times for entry were). The beauty is that all the data collected on the day is automatically transferred to your Eventbrite account. Everything is recorded in one place. You can then pull reports to gain all sorts of insights into your event and help you to run events more successfully in future. And because you collected contact details from ALL your attendees, you can re-market to all of them afterwards, helping you sell more tickets next time. 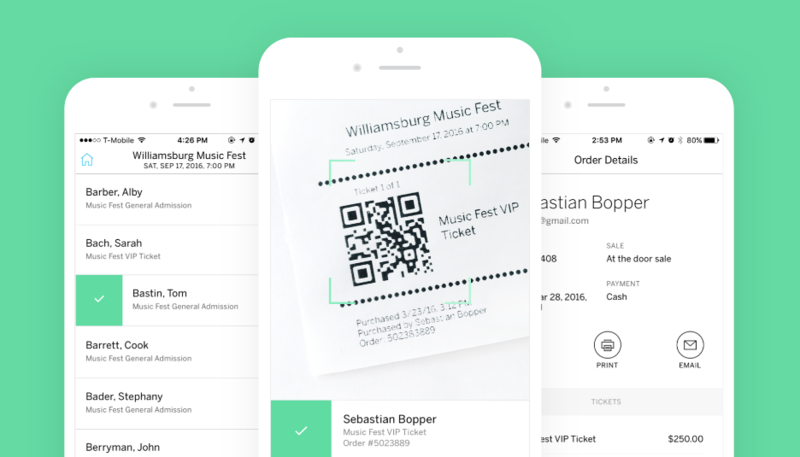 Helping you collect early revenue and plan efficiently, advanced ticket sales are great. But if you don’t give people the option to buy on the door you’re losing a potentially significant part of the market. Eventbrite, together with its Organiser app, allows you to do both while collecting really useful data every step of the way. Are you ready to maximise your ticket sales? Request your Box Office Kit today.